All moms like to think there's something protecting their children—but one woman's ultrasound gave reason to believe her child was taken care of in utero. Every ultrasound is special but Kelly Lewis found something extra special (and maybe a bit extraterrestrial) in her daughter's womb pic. Lewis, 26, shared the photo with The Mirror—in it, you can clearly see her baby's shape outlined. There's also something unusual in the image, though: What appears to be an angel is sitting directly above the outline of the fetus. Lewis isn't the only one who has seen something unusual in an ultrasound, though. 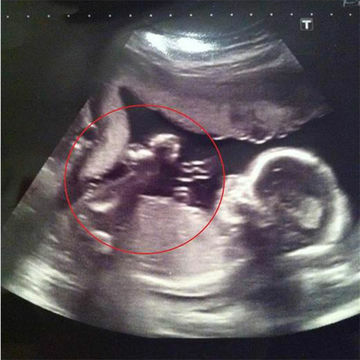 One Imgur user shared a shot of "a friend's" ultrasound. At first glance, there doesn't seem to be anything too out of the ordinary in the ultrasound—until you look to the right of the fetus. If you look closely, you can see what looks like a demon glaring at the fetus. The shot has been making the rounds, with several outlets picking up the post. But Lewis has done her part to bring a lighter, happier ultrasound story to the masses. Lewis may have seen her daughter's angelic ultrasound over three years ago but she's sharing the shot of it now to offset the darkness of the viral demon ultrasound. She told Today that she didn't even notice the unusual detail in her ultrasound when she first saw it. "it was when I showed my friend later that day—he pointed it out to me. From then on, everyone has been fascinated by it," she said. Lewis named her daughter Harper, which could be a nod to the instrument angels play. "Harper is a very well-behaved little girl. She has a warmhearted, caring and helpful personality—always polite and kind, and very sweet and innocent. She also has the sweetest smile—it's very angelic. I am truly blessed to have her," Lewis said of her daughter. It seems as though Lewis believes she and her daughter have been touched by an angel. "Yes, I'd like to believe that this is an angel," she said. "It's a nice thing to believe and a lovely thing to have."